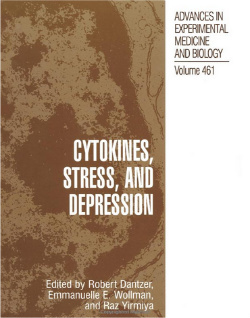 Cytokines, Stress, and Depression is edited by Robert Dantzer, Emmanuelle E. Wollmann and Raz Yirmiya, and published by Springer. Cytokines had been characterized in the early eighties as communication mole­cules between immune cells, and between immunocytes and other peripheral cells, such as fibroblasts and endothelial cells. They play a key role in the regulation of the immune response and the coordination of the host response to infection. Based on these biological properties, nobody would have predicted that one decade later cytokines would burst upon neurosciences and permeate into several avenues of current research. In neurology, the connection between cytokines and inflammation, and the demonstration of a pivotal role of some of these molecules in cell death by apoptosis, prompted the investigation of their involvement in several neurological diseases involving an inflammatory component, including multiple sclerosis, brain trauma, stroke, and Alzheimer’s disease. This movement started in the late eighties, and the corresponding field of research, known as neuroimmunology, is presently booming. In psychiatry, however, the relationship between cytokines and mental disorders was much less evident and took longer to materialize. The first indication that cytokines might be involved in psychopathology came from cancer research and internal medicine. The association between inflammation and depressed mood is now well established. Thus, there is a dose-response relationship between depression and the inflammatory markers CRP, interleukin (IL)-1, IL-6 and tumour necrosis factor (TNF)-alpha. In addition, depressive symptoms in inflammatory conditions might be primarily linked to an increase in central IL-6 concentration.